The cult of the state is a very dangerous social disease, responsible for countless millions of deaths in the last century. 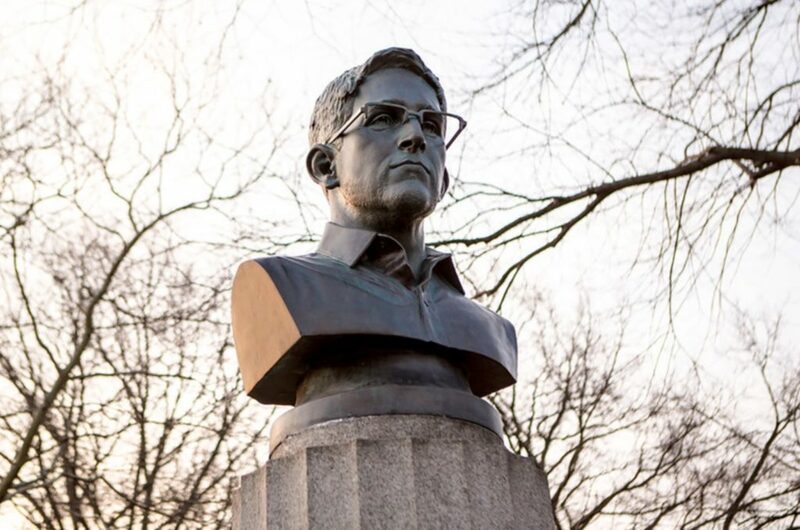 In a creative expression of civil disobedience in New York City, artists installed a large bust of NSA whistleblower hero Edward Snowden in Fort Greene Park in Brooklyn. Three artists installed a bust of former National Security Agency contractor Edward Snowden in a Brooklyn park early this morning — fusing the sculpture on top of a memorial to Revolutionary War soldiers, according to Animal New York. The bust is 4 feet tall and made out of a sculpting material that looks bronze, according to Animal New York, which says it documented the installation of the piece in Fort Greene Park on the condition that it hide the identity of those involved. City workers were sent to remove a large bronze bust of NSA whistleblower Edward Snowden after it was placed atop a statue in a Brooklyn park Monday morning. Animal New York reports that three artists installed the 4-foot, 100-pound sculpture before dawn, fusing the figure to the stone monument with an adhesive. The website, which recorded the installation of the bust, says that the adhesive shouldn’t damage the original statue. The group of artists told Animal that the bust cost thousands of dollars to make, and that they have made a mold so they can create more Snowden effigies once the one in the park is removed.